Verbal abuse can be just as destructive as physical abuse, and it's a lot harder to identify. On this page, you will learn to recognize different types of abuse, how they affect you, and what to do about them. Whether you're a victim of abuse, or a perpetrator, you can get help here. The important thing is that you're here, you care, and you're willing to change things for the better. The reason you care and want things to be better is that you are a good person with a good heart. You're in the right place. Good for you for being here, and wanting to learn. Hang in there, and you will get what you came for. You'll find solutions and recommendations about some things you can do right now. Sarcasm--This is a very common type of humor, and can be totally harmless. But it can also be very destructive. It's a little tricky to define destructive sarcasm, because it's a matter of the voice tone, attitude and timing of the sarcastic statement that makes it harmful or not. To figure this one out you need to develop empathy. If you have empathy for others, you'll be more sensitive and won't want to hurt them. Learn more about empathy skills here. When you have empathy, you will know when your sarcasm is hurting someone. 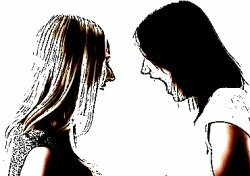 Criticism--Obviously, all criticism is not verbal abuse. However, when it is consistent, harsh and ongoing (especially toward children), it is definetely abusive. Again, the key here is to learn empathy skills. Put-downs--This is where you refer to the other person in a derogatory or demeaning way. You might be saying it to them, or to someone else in their presence. The put-down might be about the person, or something they like, do or wear. This is always a form of verbal abuse, and if it happens a lot it can even destroy a relationship. Name-calling--This can range from something seemingly harmless and playful to cruel obscenities. Nothing more needs to be said here--name-calling is never okay. Shaming and sexual abuse--We are so very sensitive in the sexual arena, and having to with all body-image issues. This type of verbal abuse is especially damaging, and needs to be stopped as soon as possible. When it comes to children, verbal abuse takes on a completely different description. Children do not have the defense mechanisms that adults have, so they are much more sensitive and susceptible to being abused. Rather than going into great detail about children and adolescents here, I suggest that you visit our page on children's basic emotional needs. Discover and learn to make the powerful journey from anger through forgiveness and back to love. Love is who you are at the core of your being, and there is always a deep yearning within you to return to your true nature. 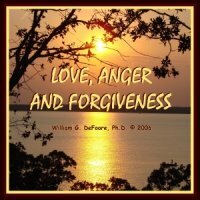 These unique and dynamic anger management CDs will help you to understand the essence of love, anger and forgiveness in all of your relationships. "Thank you. I was looking for a way to learn how to be more comfortable in the presence of anger and still treat myself and others with respect and respond peacefully. Your audio Love, Anger and Forgiveness offered me great insight and skills that I look forward to putting in practice. The spoken word is far more powerful than most of us realize. Think about it--if you've ever been insulted, put down, ridiculed or otherwise verally abused, how long did those words echo in your head? We are highly sensitive beings, and we need to be gentle with each other. These nonverbal communication skills will help with that. In some cases, victims of verbal abuse can actually become self-destructive and/or suicidal. Prolonged abuse can be totally devastating to the victims, and if this is going on in your life, don't wait any longer--take action now! "Don't wear your feelings on your sleeve!" If you are an abuser yourself, then get some help for yourself right now! I suggest you get counseling, or check out some of our products by selecting the link at the top of this page. You can also learn anger management techniques, or tell your story and get some help on this web site. If you are a victim, you also need to take action now! Healthy anger and good communication and conflict resolution skills are essential to your healing and recovery. Stand up for yourself! If you don't, most likely no one will. 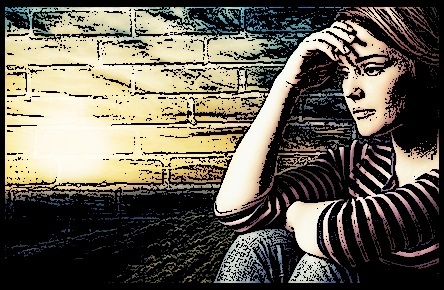 Read about dealing with abusive relationships, and follow every piece of advice you find there. Most important of all, believe in yourself and never, ever give up on being the good person you choose to be! We'll approach this from two angles - how to stop being a victim, and how to stop being a perpetrator. One option, of course, is to get away from the abuser. If you were able and willing to do that, however, you probably wouldn't be reading this. Be aware that getting away from the abuser might just be your best possible solution. If it is, and you're not willing to take care of yourself in this way because of lack of self love, you may be suffering from battered person syndrome. Another choice, which may or may not work in your situation is to be clear and assertive with the abuser. Saying simply, "This is unacceptable to me. You will treat me with respect or I will not stay in this relationship any longer." Then of course, you must follow through and leave if things don't change. I know this is not easy, but sometimes the straight-forward and simple approach is best--but you've got to mean it! You might need to be willing to call the authorities, if there is also physical or sexual abuse. If it's more than verbal abuse that you're being subjected to, then the abuser might be committing a crime and needs to be held accountable--for your safety and the safety of others. At the very least, do not believe the verbal abuse that is coming your way. Don't believe what the abuser is saying about you. Comfort and reassure yourself with positive statements to yourself about yourself, like, "I'm a good person with a good heart. I mean well, and I'm going to figure this situation out and get it fixed," and other self-directed statements like that. Spend time with friends and family that support you. Go to a battered woman's shelter (if you're a woman), or find some kind of support group. Get some professional counseling, to get the issues resolved once and for all! If you don't do anything else, tell your story on this site. First thing to try is...just stop it, if you can. You're a good person inside, and here's your chance to act on that goodness. Go back to the old childhood rule of, "If you don't have something nice to say, don't say anything," especially when you're talking to someone you love! Then go in this direction: start thinking about the positive aspects of the person you've been verbally abusing. Write down what you like, appreciate admire and respect about them, and what you'd miss if they were gone. Then tell them about those things you like about them, not once, but again and again--that is, if you really do love them. You need to find out where the verbal abuse is coming from inside you. Get a mental picture of the abuser inside you--is that who you really want to be? Next, do some journaling about all of the times you yourself have been abused--you'll find the guidelines for this type of journaling on this page. Now let's do some emotional healing, so that you'll never revert to verbally abusing anyone again. Go to this page, and you'll find guidelines for an imagery process that will help you to heal the pain, fear and anger that are behind the abusiveness. If you're not willing to do any of the above, or if you've tried those techniques and you're still being abusive, please consider getting away from the person you are abusing. No one deserves to be treated badly, no matter who they are or what they've done. Okay, thanks for hanging in there and reading this far down on the page. You're a real trooper, because most folks bail by this point! Now you can become your own best anger management resource.